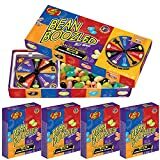 Jelly Belly BeanBoozled jelly beans are a collection of 20 lookalike flavors, some so crazy you can’t believe it, while others are the delicious Jelly Belly beans you love. New this year are Stinky Socks and Lawn Clippings flavors. Is the black jelly bean Licorice, or is it Skunk Spray? Perhaps the blue bean is Toothpaste flavor, or maybe it’s delicious Berry Blue. 3.5 oz box. Boxes are randomly mixed and may not contain all flavors.